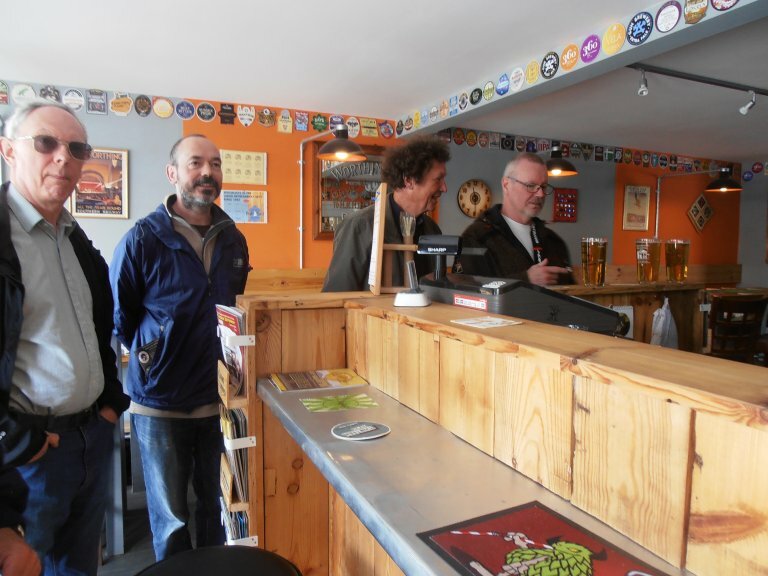 On an overcast Saturday in May, nine branch members set off in a minibus on a westward journey to visit the Pubs of the Year of the four other Sussex CAMRA Branches with the aim of assessing their potential as Sussex Pub of the Year. 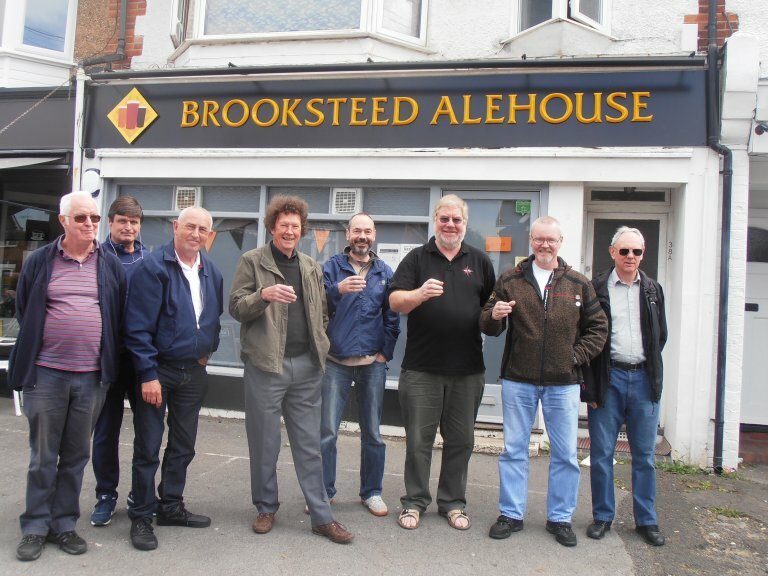 First stop was the Brooksteed Micropub in Worthing. Arriving just before opening time, the first picture shows some of the group exercising their drinking arms in preparation for the day ahead. We had the place to ourselves initially and a good welcome from Nick and Paula, the licensees, who set up the pub in 2014 and progressed to branch pub of the year in quick time. All five beers on offer were tasted and well received by members, as seen in the next pictures, then as we left heading for Nyetimber, near Pagham, the sun came out. Reaching the Inglenook Hotel, we sat in the garden for lunch and were able to select from a good range of beer styles, although as the pre-lunch picture shows, most went for extreme light or extreme dark. 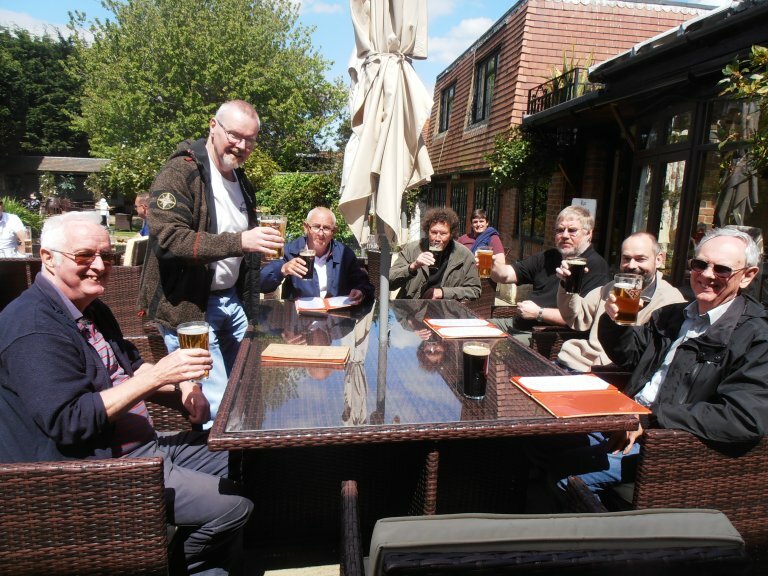 After lunch the bus headed north east to Horsham and our next stop at the Malt Shovel where Ballard’s Mild proved a popular choice from amongst another good range of beers. Back on the bus, it was off to our final scheduled pub, the Gardener’s Arms, Lewes; much visited by all in the party on previous occasions. Another comprehensive selection of beers on offer, then it was back on the bus for home. Score sheets were completed and when they were tallied up, it turned out that the first and second places could not have been closer. 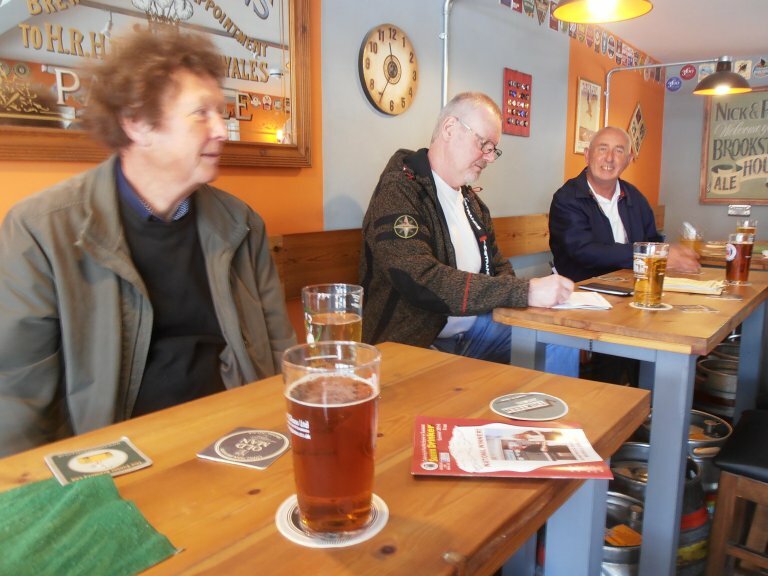 Both gained over 500 marks on the CAMRA Pub of the Year assessment scheme, with the Gardener’s Arms just one mark ahead of the Brooksteed Micropub. The business of the day completed, it was agreed that all the pubs were good and then most of the party found themselves rounding things off in the Hurst Arms or the Tower in their respective towns.